The 27-year-old was the pick of the Blues’ side in Tuesday’s impressive victory over League One outfit Coventry City. And the triallist repeated the trick with a superb showing in last night’s 2-0 success at Woking. Evans scored one and created the other in the Surrey rain as Paul Cook’s side made it three successive pre-season wins. Once again operating as part of the attacking midfield three in a 4-2-3-1 system, the former Fleetwood man opened the scoring in the 28th minute with a vicious right-foot shot. A mere four minutes later his corner picked out another triallist, Matt Clarke, to net with a powerful header. In a dominant first half, the Blues also had Conor Chaplin strike the crossbar on 10 minutes at the Kingfield Stadium. After the break it was a more even affair, yet Evans continued to shine as he bids to earn himself a permanent Fratton Park deal. Regardless, the fifth friendly of the summer yielded a victory to ensure Cook’s men are presently unbeaten ahead of their final fixture at Gillingham on next Saturday. Cook sprang a surprise by naming triallist Brian Murphy in his starting line-up – ahead of regular keeper Paul Jones. 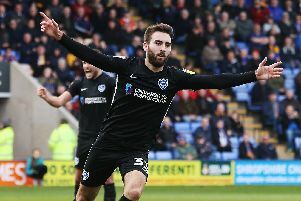 The Irishman’s elevation into the first team arrived on the day Michael Poke sealed a loan move to Eastleigh until January, leaving Pompey without a number two stopper. Murphy was one of four triallists in Cook’s side at the Kingfield Stadium with another – Ben Davies – on the bench. Once again Frank van der Struijk was named at right-back, with Clarke in the centre of defence and Evans in the midfield three. With Clarke partnering Christian Burgess, club skipper Paul Robinson dropped to the bench and left-back Enda Stevens completed the back four. There was a return for Gary Roberts after missing the previous two games with a knee injury but proving his fitness by requesting to play with the Pompey Academy yesterday. He lined up in the attacking midfield three alongside Evans and Kal Naismith, with Conor Chaplin pushed up as the lone striker following his recent fine form. However, there was no Theo Robinson in the squad after the Blues decided against offering him a deal following a trial. In addition, Matt Tubbs, Adam McGurk, Kyle Bennett and Adam Barton were all absent nursing knocks, while Ben Tollitt is still away on holiday. Pompey kicked off and within two minutes Evans’ charge up the pitch was halted by a foul 30 yards from goal down the right. Roberts took the resulting free-kick but his left-foot shot skidded wide of the post, although keeper Nick Hamann looked in control of the danger. Then Naismith’s shot was blocked and fell kindly to Roberts on the right but his effort was scuffed and the ball screwed comfortably wide of the intended target. At the other end, in the ninth minute the covering Van Der Struijk did well to block Jake Caprice’s dangerous cross from the right, with Murphy collecting the loose ball. Moments later, a sublime ball from Roberts down the left channel was collected by Chaplin and the youngster’s powerful drive rattled the crossbar with the keeper well beaten. Chaplin then slid in a shot as Hamann came off his line. The ball trickled towards goal before the keeper appeared to gather, although two defenders were on hand to usher it to safety if required. Woking had their first attempt on goal in the 19th minute when Godfrey Poku crashed a first-time 30-yard right-foot effort well over the bar, striking the top of the stand housing the travelling Pompey fans. The deadlock was broken in the 28th minute through a stunning right-foot strike from Evans. Naismith was the instigator, threading a sublime pass from deep into the path of the midfielder, who collected it before lashing a swerving shot past Hamann. The former Fleetwood man nearly grabbed a second on 32 minutes with a snap-shot from outside the area which skidded on the turf and was partially blocked by the keeper before it was cleared for a corner. But from that set-piece it was 2-0. Evans flung in a cross from the left and Clarke headed home from inside the box. Pompey were now firmly in control of the action and on 40 minutes a fine interchange around the box between van der Struijk and Chaplin resulted in the latter bending a left-foot shot well wide. Cook made one change at the break with Davies replacing van der Struijk at right-back. Within two minutes of the restart, Cards substitute John Goddard drove in a low shot from long range which Murphy confidently dealt with low down. Goddard tested the Blues keeper once again on 55 minutes when he cut in from the left and drove in a shot which Murphy did well to tip away at full stretch. Pompey were failing to live up to their first-half form, although Roberts did squeeze through a pass to Chaplin but the youngster’s touch let him down and the keeper gathered. On 67 minutes, substitute keeper Jake Cole pulled off a superb stop to thwart Evans’ powerful right-foot shot after Roberts had squared a pass from the left. In the dying moments, Goddard’s cross was struck goalwards by Scott Rendell and deflected off Pompey’s post before bouncing to safety. Moments later the final whistle sounded to end another solid Blues display and a third victory in a row.